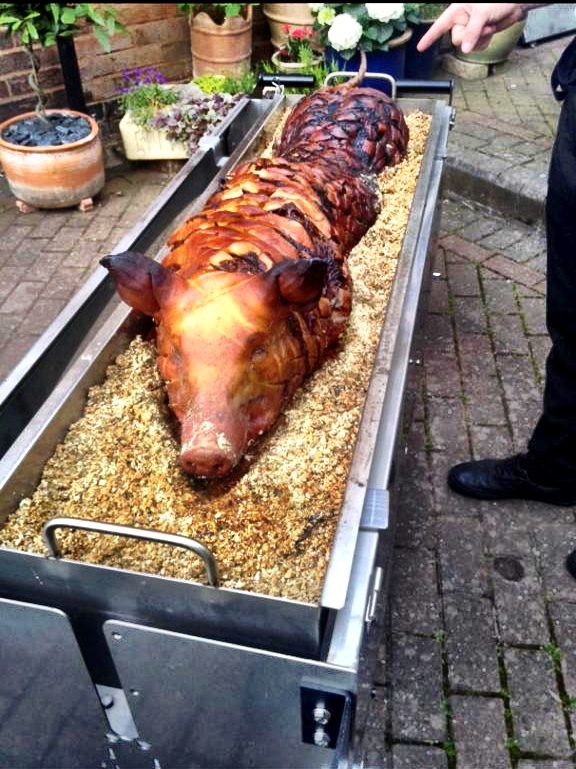 Hog Roast Aberdeen had a great time yesterday, catering for Samantha’s christening at the family home. We’re often asked to cater at home, in back gardens mainly, but if there’s enough room and ventilation, we can also cook hog and spit roasts indoors too if required. However, Samantha’s parents asked us to cook a hog roast outside in the fresh air, to make pigs in buns for 35 guests, as well as put together a couple of salads. We can actually make much more than hog and spit roasts, such as barbecues, meals with several courses and our Southern Slow Roast that features several sides to complement three marinated meat dishes, but often enough, our customers know that they want our famous hog roast rolls. We prepare the meat from scratch at your venue and then cook it for several hours until the insides are soft, tender and moist, and the skin has turned into salty, crispy crackling. Once it’s had a short rest, we carve away and fill fresh bread rolls and wraps with meat, crackling, apple sauce and sage and onion stuffing and then hand them over to you and your guests to devour. You can add your choice of condiments that we bring along or just eat as is – it’s up to you. On the morning of Samantha’s christening, a few hours before we would be serving, Hog Roast Aberdeen headed to the family home to set up our gazebo, serving table and hog roast machine and then prepared the meat to be roasted. Before long, after scoring all over and then covering with plenty of water and salt, it was sizzling away in its own juices and we just had to keep a watchful eye on it. By early afternoon, Hog Roast Aberdeen had cooked the hog to absolute perfection, made our crunchy coleslaw and put together a seasonal green leaf salad, set out all the sauces, stuffing, rolls and wraps on the serving tables and got ready to serve the hungry guests some lovely food. The hog was stripped clean by the end of service, as everyone loved them so much that they came back for seconds or thirds. Garden Party Hog Roast, Strathkinness. A busy weekend with a hog roast in Wellwood for 200!